In blender, place chocolate chips, brandy and eggs. Remove center piece of blender lid; secure lid on blender. In 2-quart saucepan, heat whipping cream and coffee powder over medium heat to boiling. Remove from heat. With blender running, pour hot cream mixture into blender; blend on low speed until chocolate is melted and mixture is smooth. Place clean kitchen towel over opening in blender lid to avoid splatters, if necessary. Immediately divide chocolate mixture among 6 (3-oz) small glasses. Cover; chill at least 3 hours. 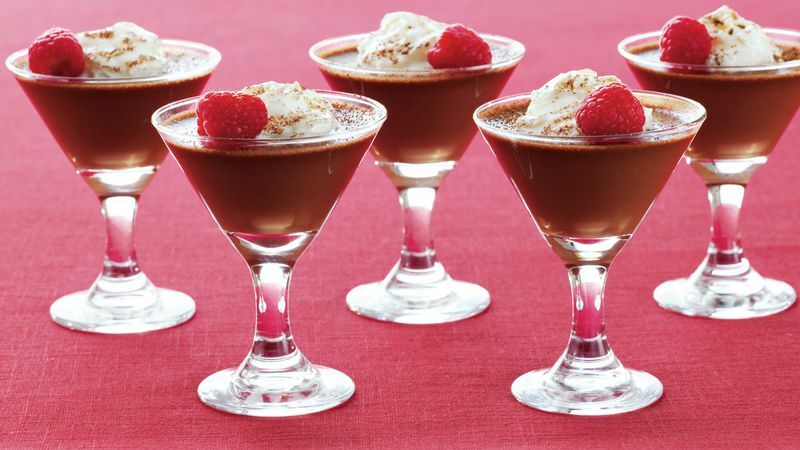 Top each serving with 1 tablespoon whipped cream and a raspberry. *Pasteurized eggs are uncooked eggs that have been heat-treated to kill bacteria, which can cause food poisoning and gastrointestinal distress. Because the eggs in this recipe are not cooked, be sure to use pasteurized eggs. They can be found in the dairy case at large supermarkets.